Health insurance is among the most important purchases you’ll ever make. Comparing health plans and obtaining individual insurance quotes and information has never been easy. Thanks to the Affordable Care Act, also known as Obamacare, you have consumer protection on your side. The Obamacare mandate requires that most people obtain medical insurance coverage. If you are not already enrolled in a health plan that meets the Affordable Care Act minimum essential benefits requirements, you may need to switch plans. The mandate requires that most Americans and legal residents obtain health insurance that meets the standards set by the Covered California Exchange. Those who do not get covered for health insurance may face a penalty. Your employer does not offer group plans. You are enrolled in a group plan, but it does not cover your spouse or dependents. You are enrolled in a health plan, but the premiums are too high. You are enrolled in a health plan, but your benefit needs have changed. 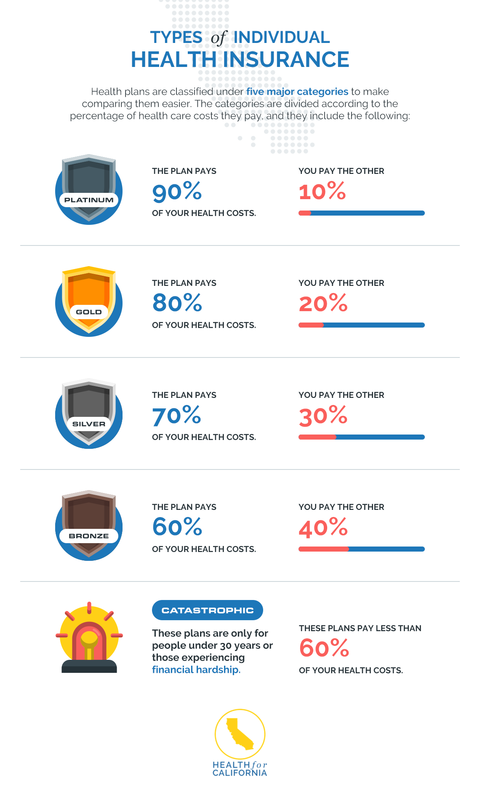 Individual health plans vary in how they are structured and how much they pay for your health costs. Under the ACA, all health plans must meet certain minimum essential coverage, meaning that no one can be denied during the Open Enrollment Period for any pre-existing medical conditions. Platinum – Plan pays 90% of your health costs. You pay 10%. Gold – Plan pays 80% of your health costs. You pay 20%. Silver – Plan pays 70% of your health costs. You pay 30%. Bronze – Plan pays 60% of your health costs. You pay 40%. Catastrophic – These plans are only for people under 30 years or those experiencing financial hardship. These plans pay less than 60% of your health care costs. Before purchasing individual health insurance, you need to think about your health care needs and budget. Then, compare various plans to find the most suitable fit. Here are some questions you need to consider. Which providers are in the network? How much out-of-pocket costs do you pay? How much does the plan pay for your coverage? Think about your budget as well as your health care needs, and find out how much it will cost you in insurance premiums and out-of-pocket costs for every plan you consider. Covered California makes it easier to compare different plans and choose the one that fits your individual health needs and budget. Making a smart choice in health insurance isn’t easy, but the research you do now will pay off later when you need health care for yourself and your family. Take advantage of our online services at Health for CA Insurance Center to get free, instant quotes on California health insurance plans for individuals. Just fill out our confidential form to get started.